Size: 5.4" x 2.7" x 0.35"
The Radio Shack EC-4002 is an OEM-version of the Toshiba LC-836MN could be called the first portable electronic Databank. 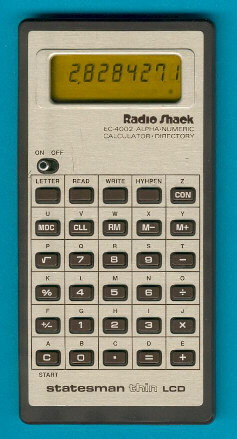 It was introduced already in the year 1978 and was 9 years ahead the first Mini Data Bank sold by Texas Instruments. The alphanumeric display uses an odd 8-segment layout with one additional segment to the standard calculator layout. The display on the right reads "MEMORY". Don't miss later Personal products like the Avigo, introduced 20 years later.